The teaser has received thumbs up from all around and has created new records in the digital world. Ram Charan’s Rangasthalam will be the most awaited for film in South Indian cinema this season. Directed by Sukumar, Rangasthalam will have a retro look to it since it is set in the mid 1980s in a rural village in Andhra Pradesh. The makers released the teaser of Rangasthalam yesterday, January 24th 2018, and the promotional video received overwhelming response from fans of the Mega Power Star and Telugu audiences in general. The teaser indicates the kind of role Ram Charan plays in the film and what the story could be all about. Ram Charan narrates about the life in his village and reveals that he plays a hearing-impaired in the film. The teaser has received thumbs up from all around and has created new records in the digital world. 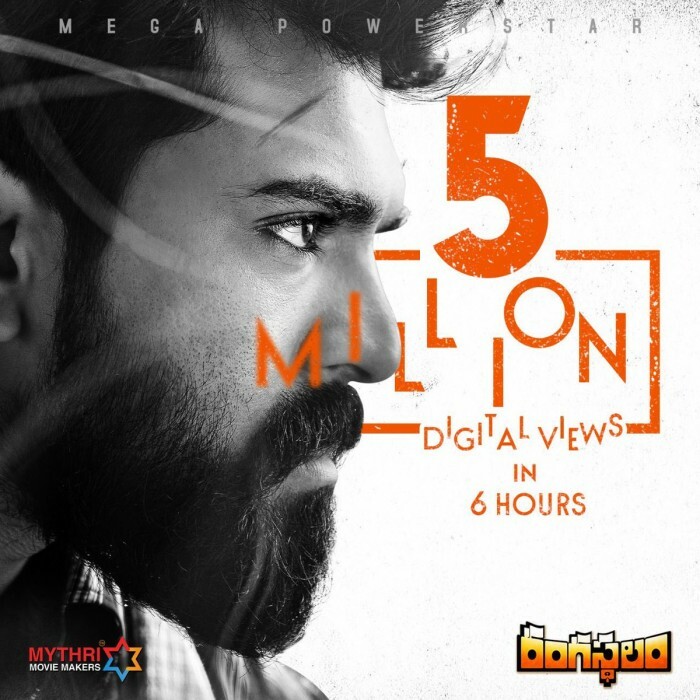 According to the makers, the teaser of Rangasthalam has clocked more than 5 million views in less than 5 hours of release and the number is increasing after each passing hour. This has created a huge buzz around the film and indicates the kind of expectations general audiences have on the film. Ram Charan looks impressive in the look he sports in the film and leaves his fans asking for more. What was disappointing for everyone was that the teaser did not have any glimpse of Samantha Akkineni who plays the leading lady in the film. The teaser clearly indicates that the film will be a Ram Charan show all the way. Ram Charan has been, lately, posting pictures on his social networking page from the shooting locations of ‘Rangasthalam’ which has kept fans of the mega family quite excited about the film. The film is said to be a period drama and the makers have ensured that every single aspect of the film portrays the time period the film is set. ‘Rangasthalam’ is captioned ‘1985’ indicating that the story of the film is set in that year.